Have you ever heard of the CHAR 500? Maybe you have. Most people probably haven't. But it might be something that you should know about. The CHAR 500 is the form that most organizations engaged in charitable activities in New York State are required to file. 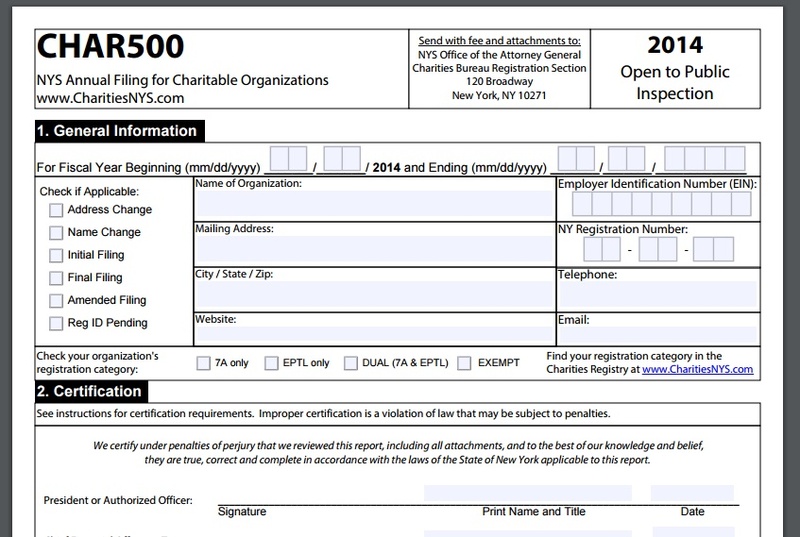 If your organization (a) solicits charitable contributions; (b) solicits grants from foundations and/or government grants, (c) engages in charitable activities of any kind; or (d) holds any property for charitable purposes, then your organization is required to register through the New York State Charities Bureau and annually file a CHAR 500. Under New York State law, "charity" is defined broadly. According to the NYS Attorney General's office, "charity" includes "purposes such as education, relief of poverty, cultural programs, promotion of health and research to cure disease, and many other purposes that are beneficial to the community." Because Friends groups exist for the benefit of the community, they are classified as charitable organizations and as so must register with the NYS Charities Bureau. I belong to a Friends group that has never filed a CHAR 500. Are we in trouble? Where do we go from here? You aren't in trouble if you aren't already in trouble! If you're just now noticing that your organization has never registered with the NYS Charities Bureau, don't fret. The best thing to do is register right away. The form to initially register with the NYS Charities Bureau is the CHAR 410 (full instructions for the form are available here). Don't worry, but also don't delay your registration once you are aware; the NYS Attorney General has the power to seek civil penalties of $1,000 per violation and up to $100 per day for organizations who have not complied with registration requirements. We're about to form a new Friends group. How do we go about registering with the NYS Charities Bureau? You simply submit a CHAR 410 (again, instructions available here). In future years, you will submit a CHAR 500 annually (instructions for that form are here). I think our former board president filed a CHAR 500 a long time ago, but we haven't filed one lately. What should we do? Again, simply submit a CHAR 410 (again, instructions available here). And be sure to submit a CHAR 500 annually from here on out! I think that we're exempt from filing a CHAR 500. How do I find out definitively? The "Schedule E" form from the NYS Charities Bureau lists in detail which organizations are exempt from registering. To request registration exemption, an organization is required to file a Schedule E along with their CHAR 410. Here's a list of a few types of organizations that are exempt from filing the CHAR 500: organizations controlled by a government agency, who do not operate in New York State, hospitals, educational institutions, religious organizations, historical societies chartered by the SUNY Board of Regents, and several others. For a complete list, please see the Schedule E form. Why is it important to file a CHAR 500? Because if you don't, the state will instantly confiscate all the money you've raised. Just kidding! But now that I've got your attention: the real reason it's important is because only registered charities qualify for most grants, foundation gifts, etc. Also, as mentioned above, the NYS Attorney General has the power to seek civil penalties of $1,000 per violation and up to $100 per day for groups who have not complied with registration requirements. Best to get it done! My Friends group just attained 501(c)(3) status. Do we also have to register with the NYS Charities Bureau? Yes! 501(c)(3) status is a federal designation through the IRS. The NYS Charities Bureau is a New York State bureau in the office of the Attorney General. You do not necessarily have to 501(c)(3) status in order to be registered with the NYS Charities Bureau. My Friends group files their CHAR 500 every year. Tell me something I don't know! Why did PTNY write an article about paperwork? So that your organization, if it hasn't already registered with the NYS Charities Bureau, does so now. We want Friends groups to avoid fines and be eligible for grants, and luckily, the process of registering is fairly easy. Check out the New York State Charities Bureau website for more information and links to all applicable forms. If you have specific questions about how Friends groups fit into this bureaucratic jumble, feel free to contact Parks & Trails New York staff and they'll help to answer your questions!